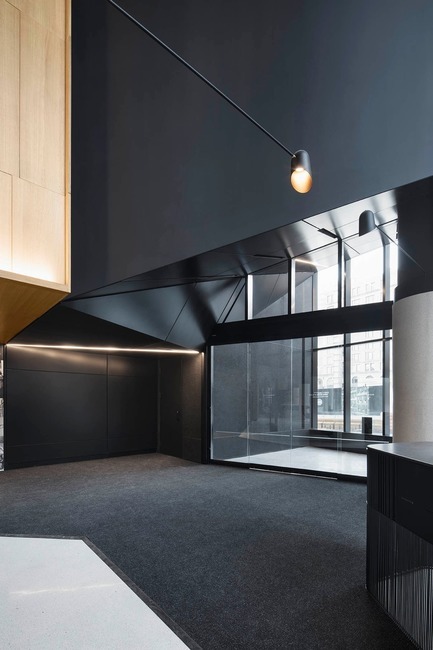 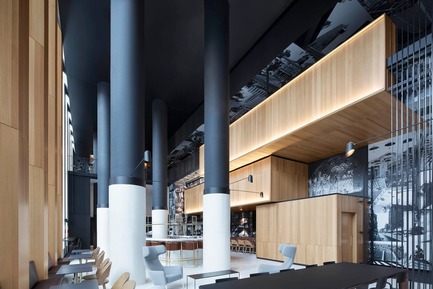 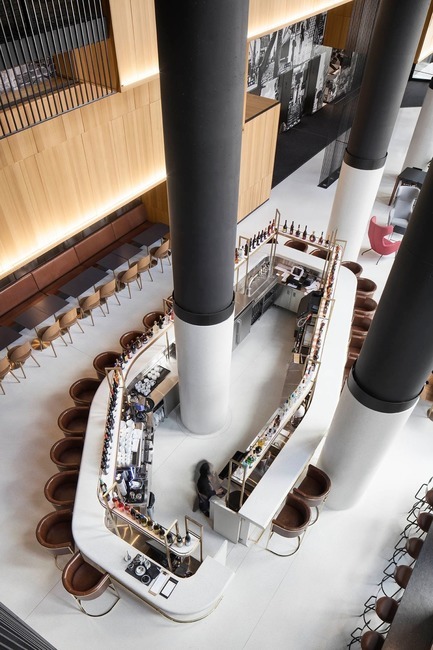 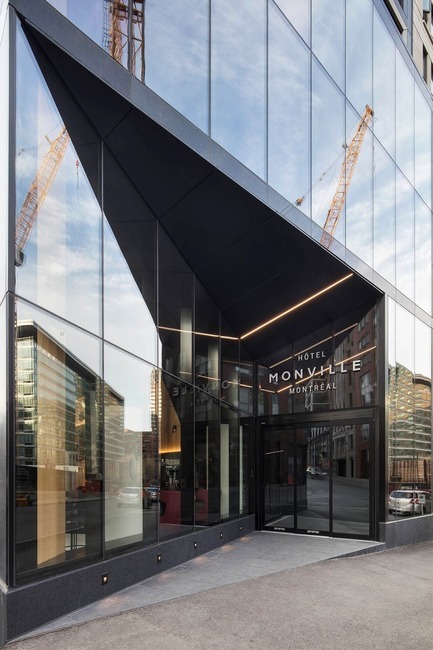 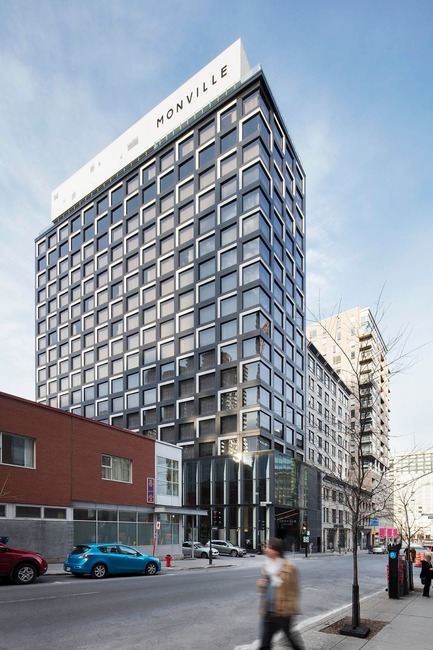 ACDF Architecture, a dynamic and experienced architectural firm, is proud to unveil the distinct sophistication of Hôtel Monville, the first in a collection of future properties envisioned by the owners of Old Montreal’s Hotel Gault. 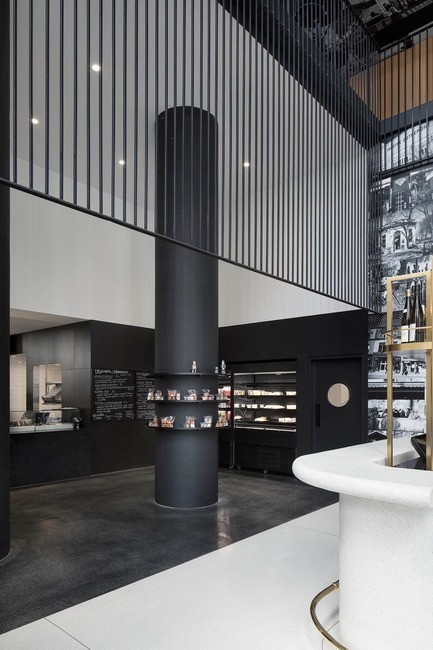 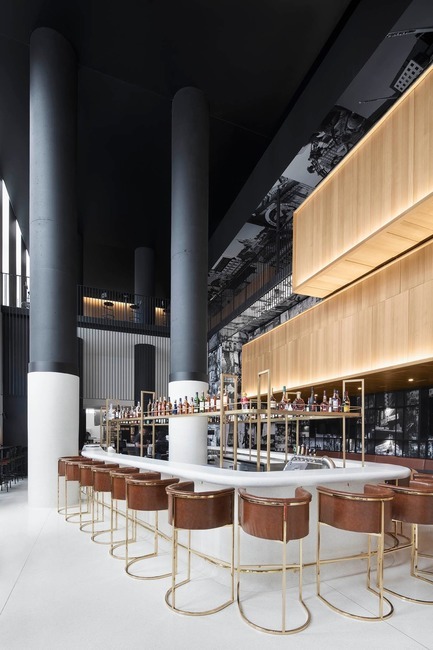 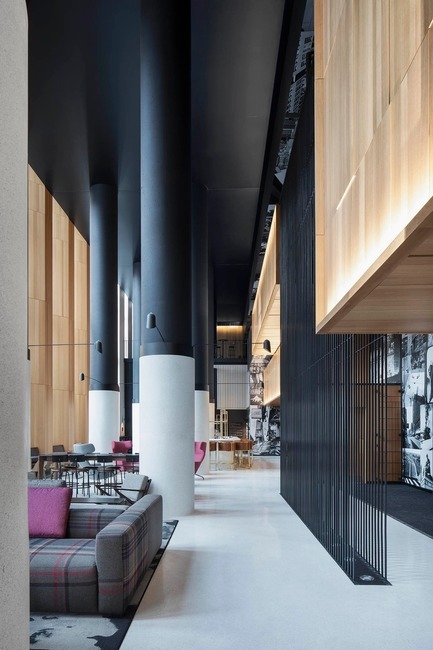 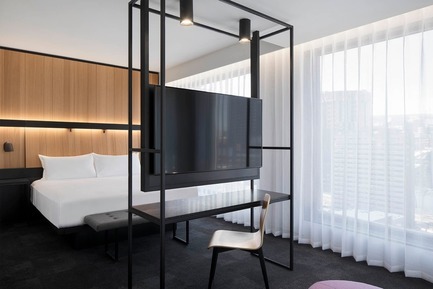 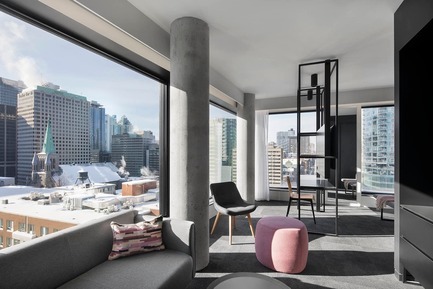 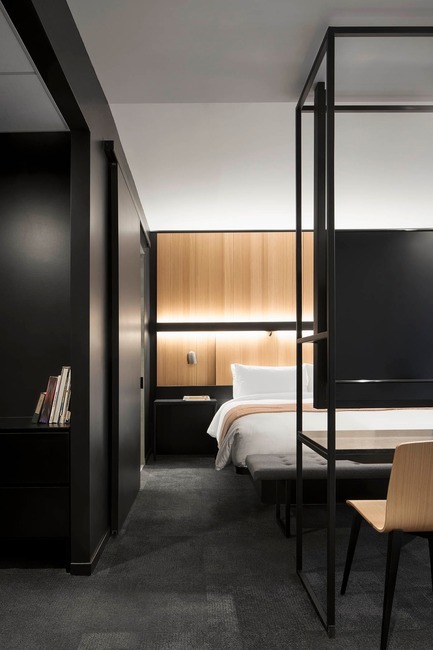 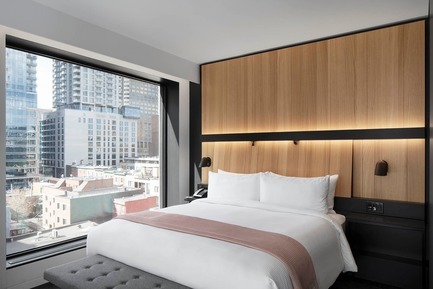 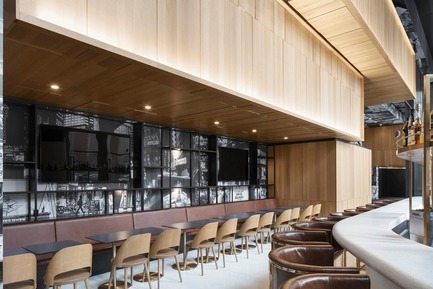 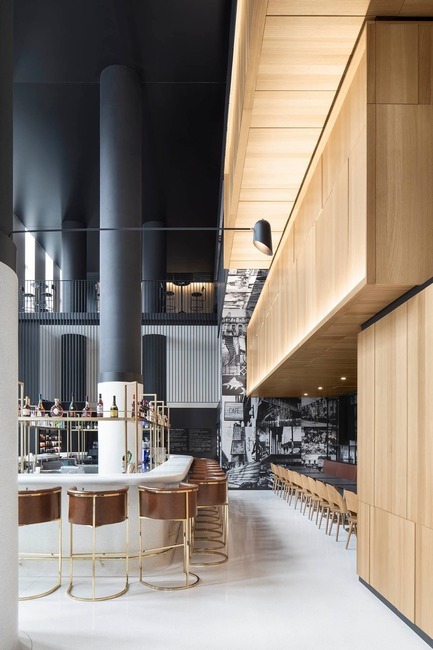 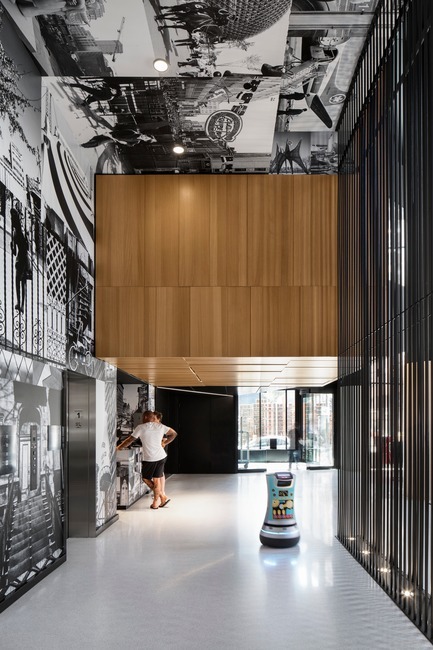 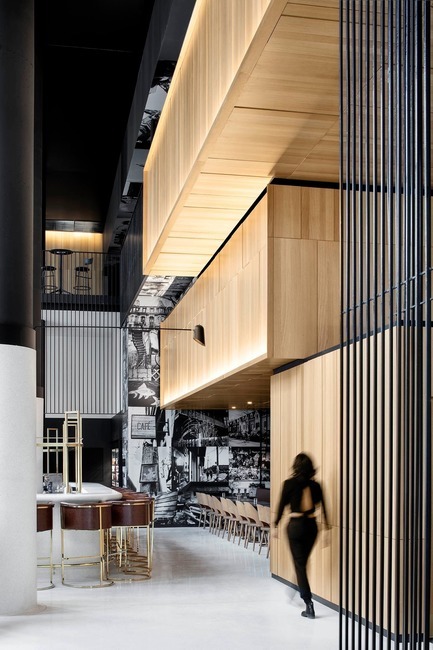 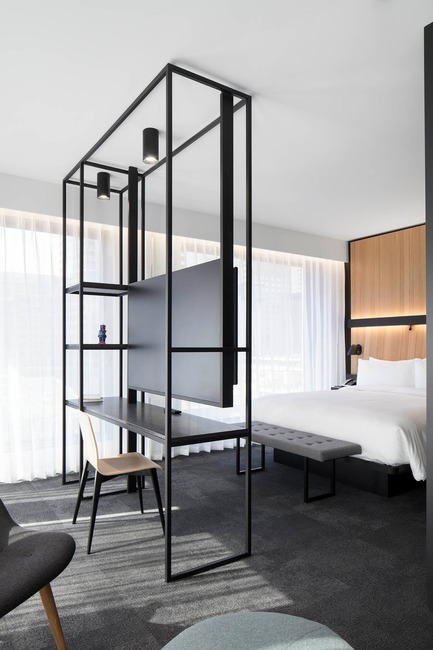 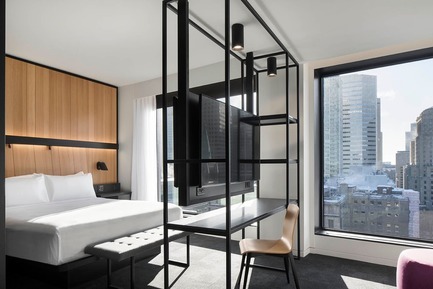 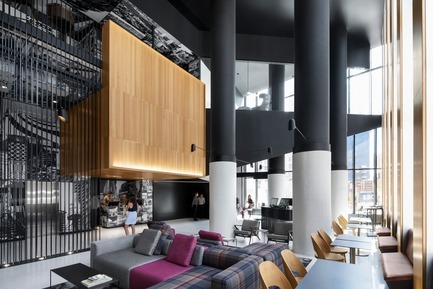 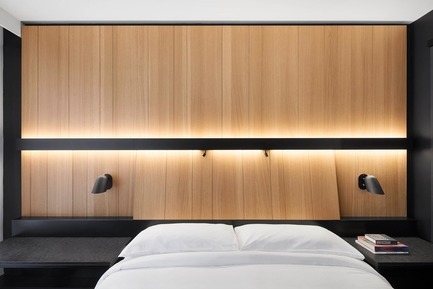 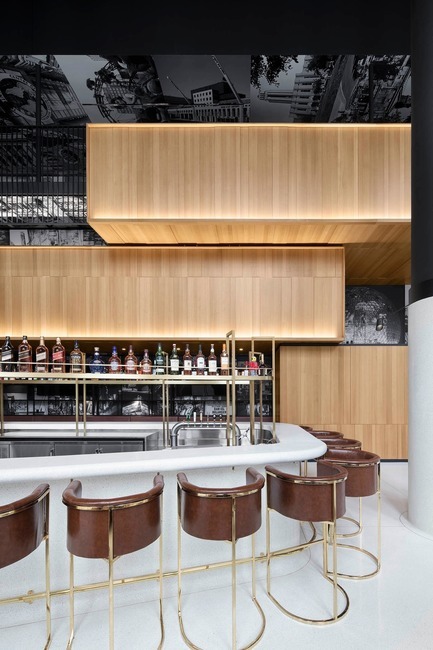 Opened in March 2018, Hôtel Monville exudes Montreal chic, with a balanced blend of contemporary style and historic charm that embodies the essence of its urban surroundings. 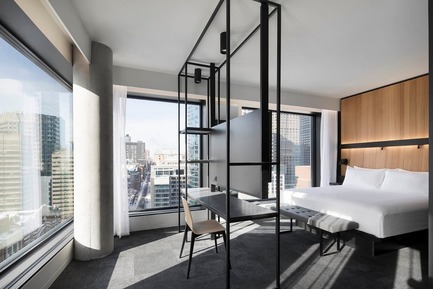 Just steps from Palais des congrès, historic Old Montreal and the city’s lively Quartier des Spectacles, distinction begins from the outside in. 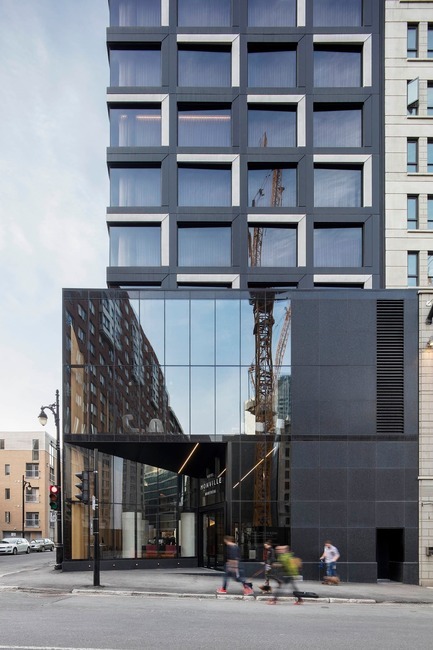 Looming tall over the vibrancy of the surrounding downtown neighbourhood, the hotel’s black & white patterned ‘tromp l’oeil’ façade adds a perception of depth to the building’s striking appearance. 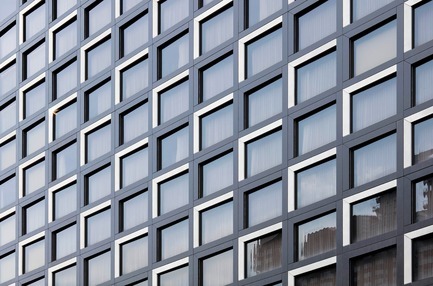 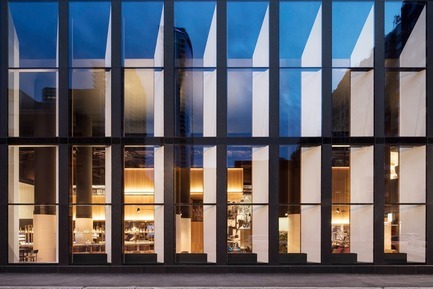 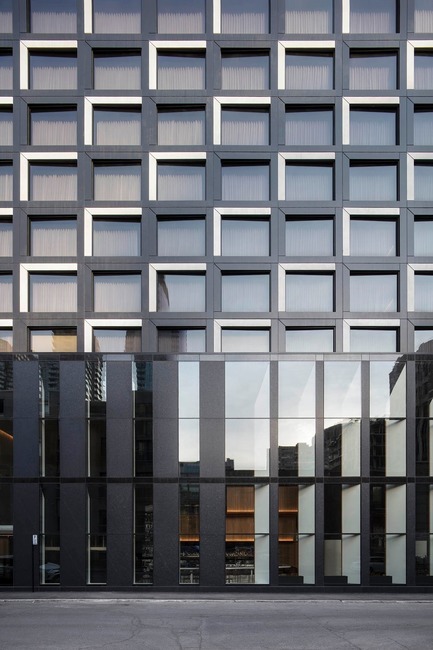 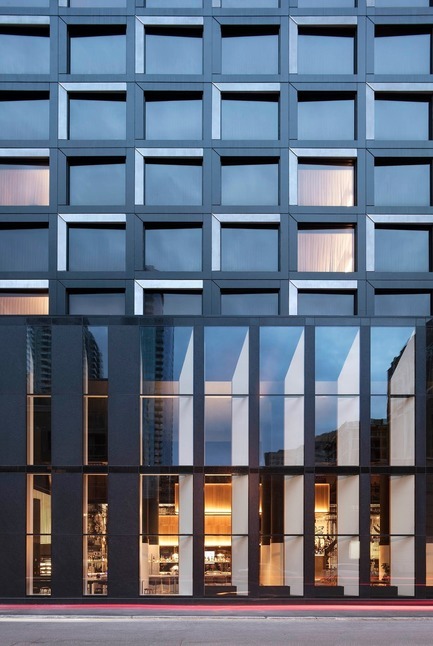 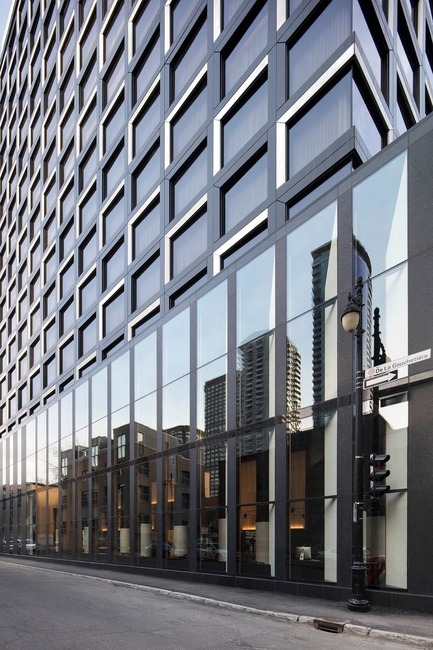 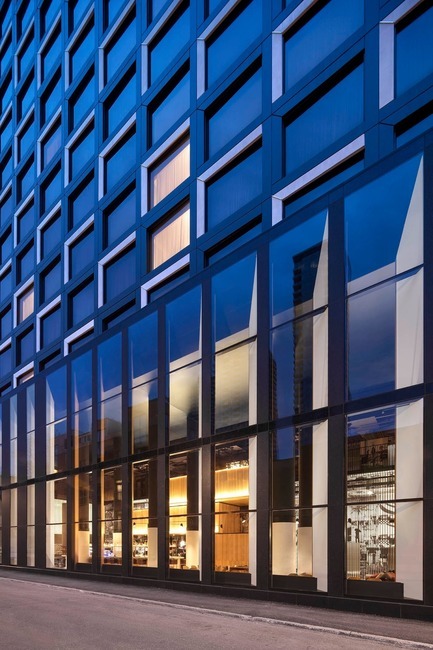 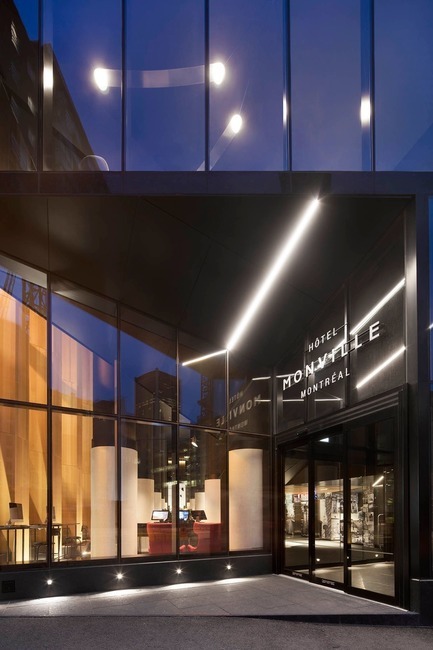 A three-storey curtain wall adorns Hôtel Monville’s patterned external façade, providing passersby with intriguing views overlooking the lobby and its vibrant atmosphere. 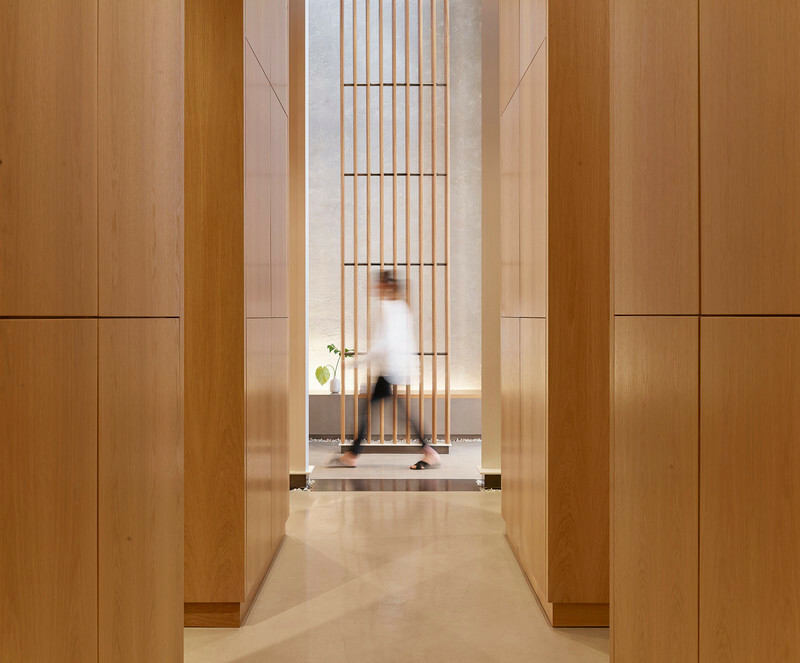 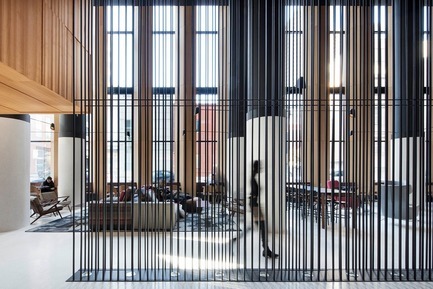 The vestibule entrance expands into a triple-height lobby, framed by stacked volumes of warm oak and cathedral-style white columns whose lamp-lit bases add ambiance to Hôtel Monville’s inviting public spaces. 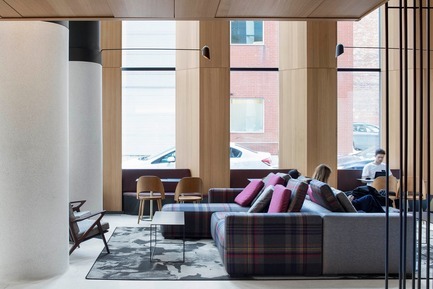 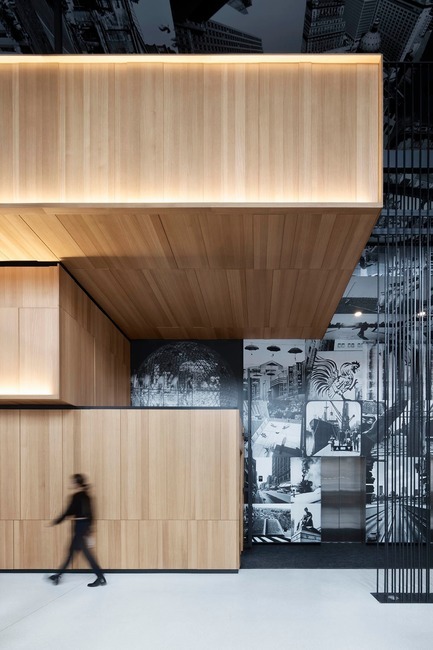 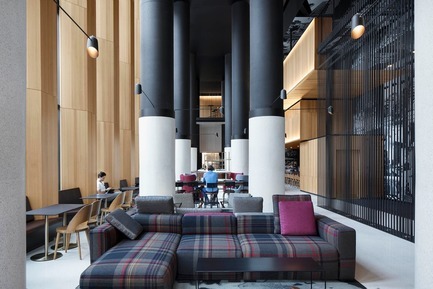 Tartan sofas and leather banquettes encourage social interactions in an area framed by vintage black and white photos of Montreal life, forming part of a customized mural commissioned from local artist Valerie Jodoin Keating. 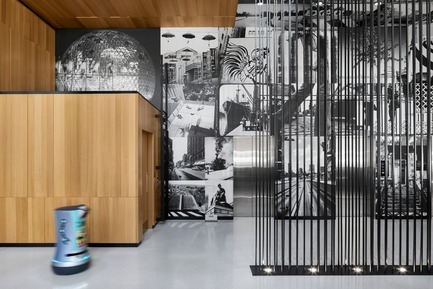 The vibe of Hôtel Monville begins in its lobby. Beyond the traditional spaces of a functioning hotel, a DJ booth crafted into the surrounding oak motif sets the mood for an adjoining lobby bar featuring white terrazzo tables and countertops, impeccably highlighted with brass detailing. 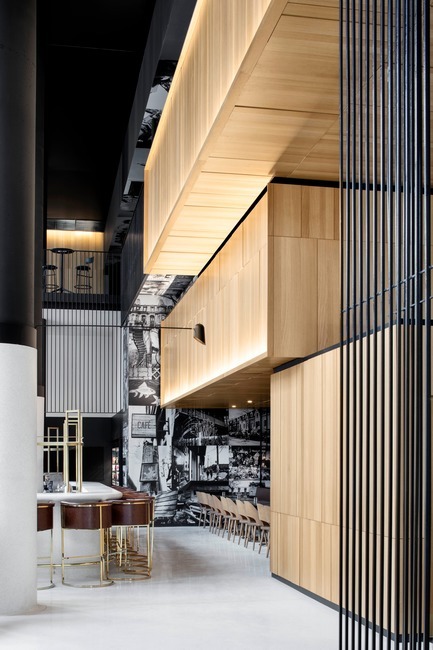 The Gourmet Monville Café completes the entrance level’s enticing offerings, with an array of local cuisine that transitions from day to night. 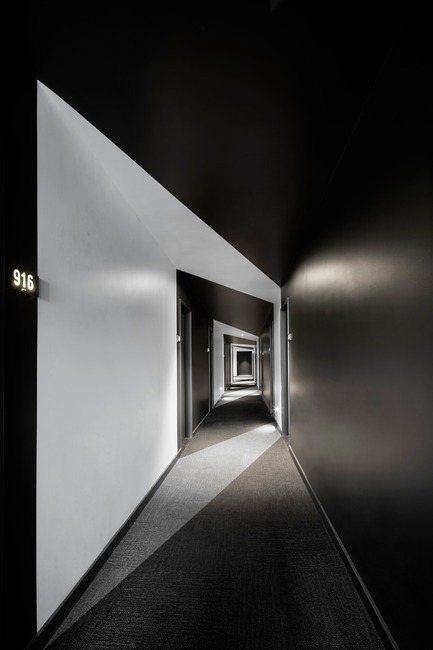 Beyond the compelling allure of Hôtel Monville’s public spaces, much more awaits guests of the 269-room property. 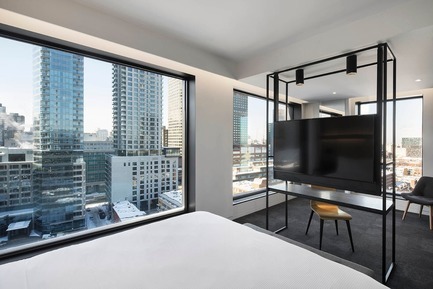 Floor-to-ceiling windows provide guest suites with stunning city views, while expanding perceptions of accommodations steeped in comforts including king-size beds, oversized oak headboards, custom furnishings, Rain Shower heads and Nespresso coffee machines. 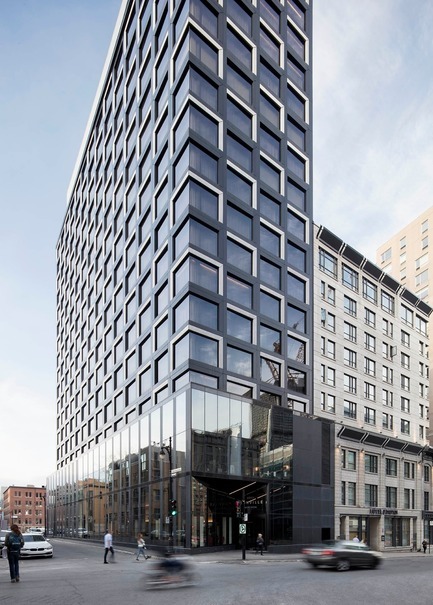 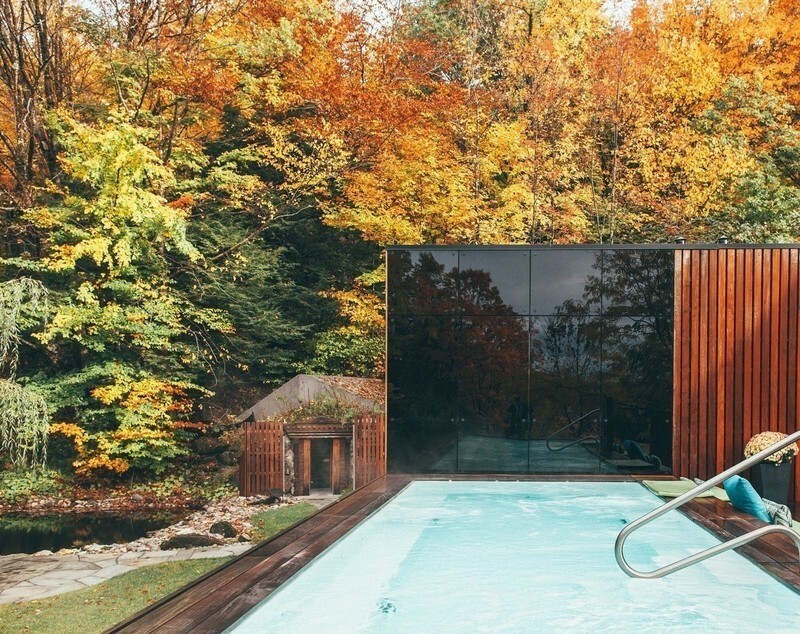 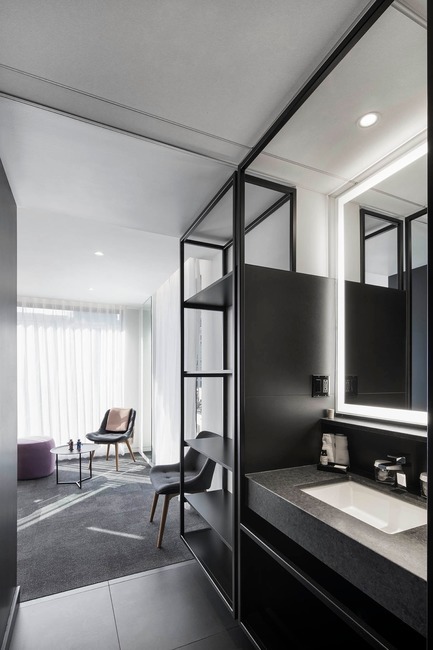 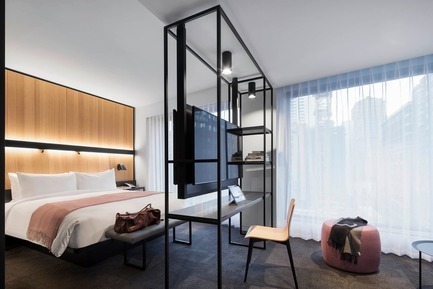 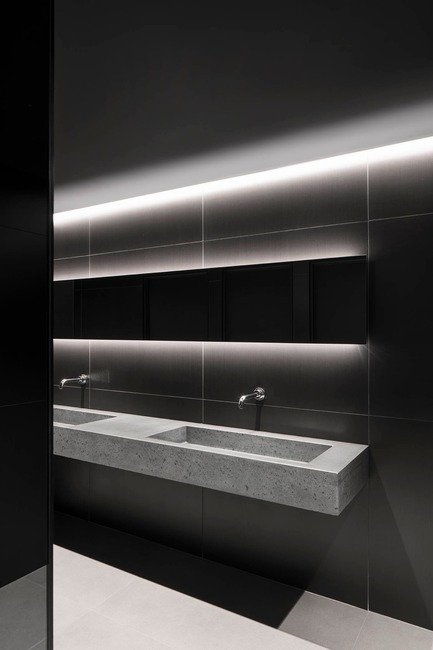 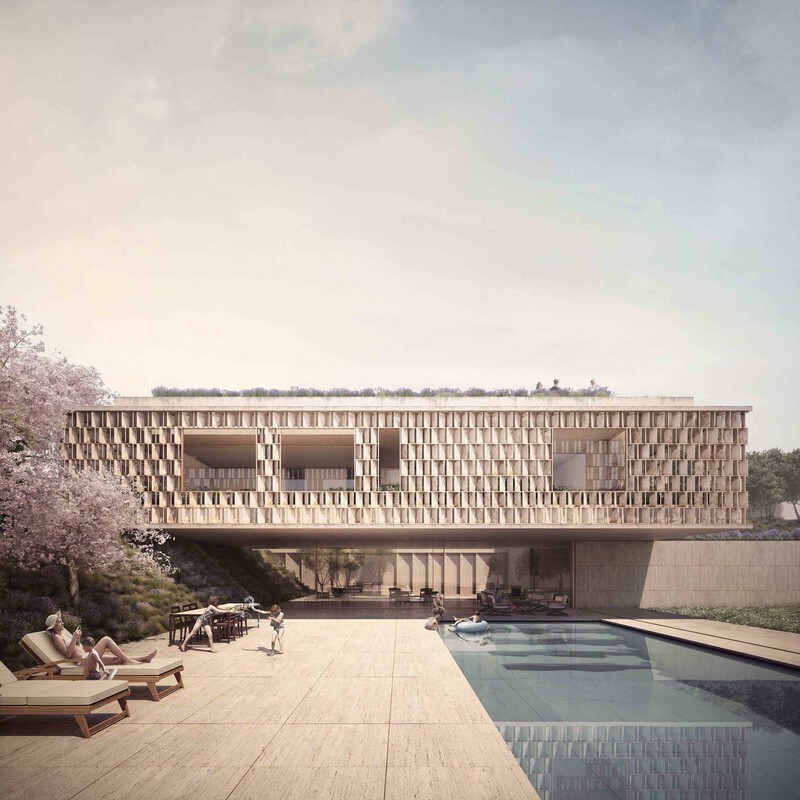 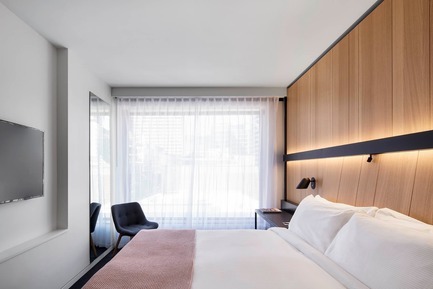 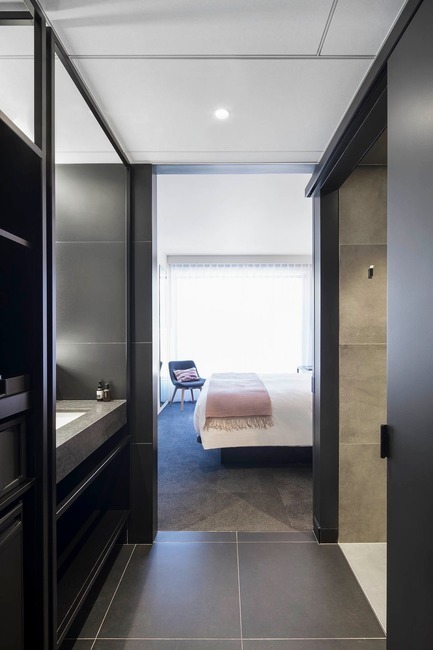 In addition to modern and sleek aesthetics, Hôtel Monville is designed for 21st century connectivity, incorporating state-of-the-art compatibilities and technology offerings that enhance the guest experience. 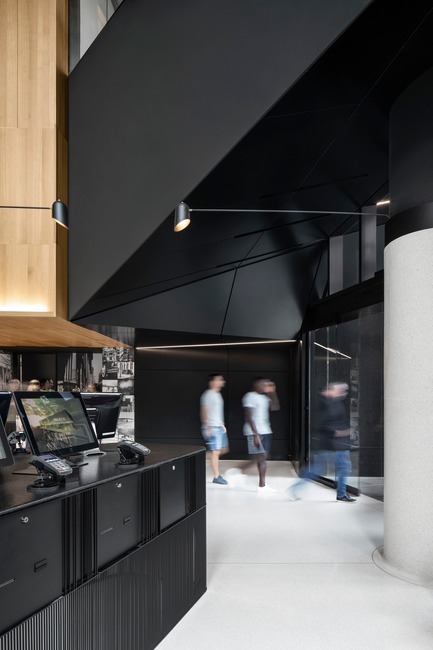 Advanced technologies include online and electronic kiosk check-in options and Smart TVs that sync with personal devices. 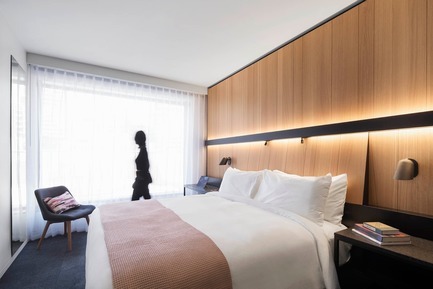 Additionally, Hôtel Monville is Canada’s first property offering autonomous robot room service delivery courtesy of a robot designed by California firm, Savioke, which carries food orders directly to guest rooms in record time. 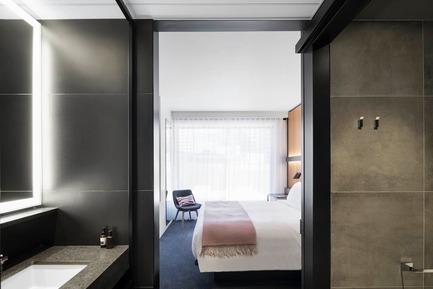 Finishing touches to the client’s vision of infusing local life, history, culture and vibrancy into Hôtel Monville include lighting from Montreal studio Lambert & Fils, all-natural bath products from Quebec company Oneka and staff uniforms designed by Canadian brand Frank & Oak. 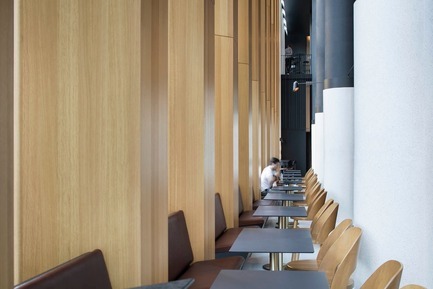 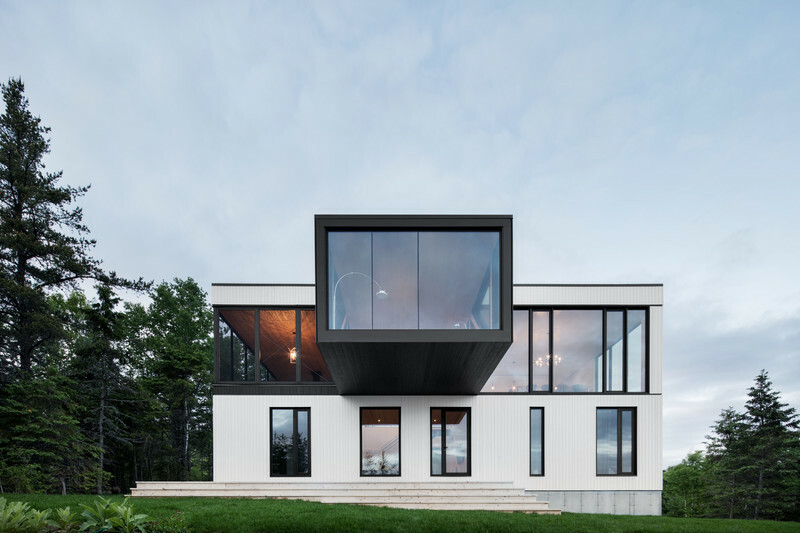 Montreal-based and globally focused, ACDF is one of Canada’s most energetic and exuberant young architecture firms. 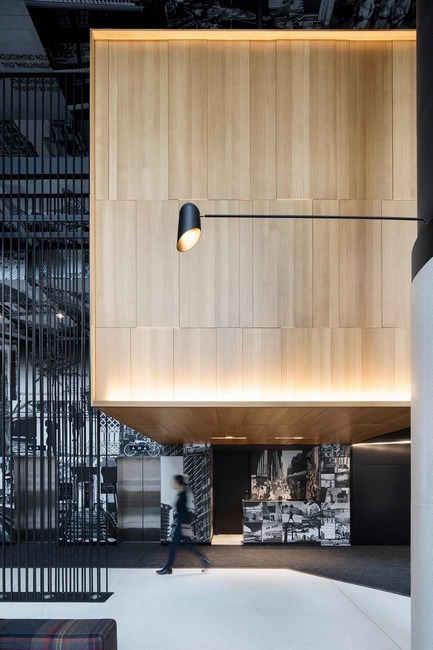 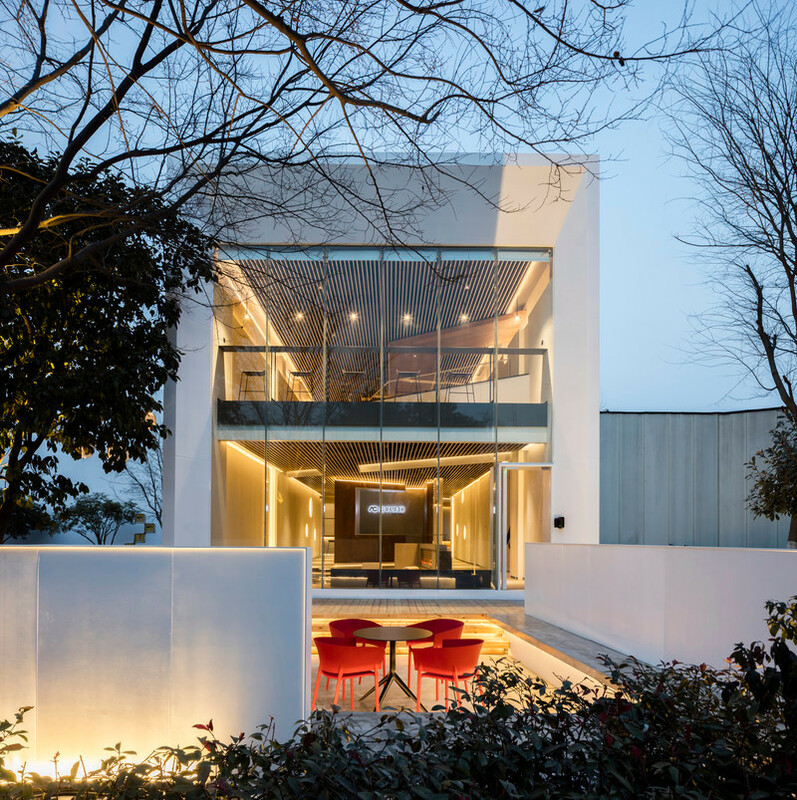 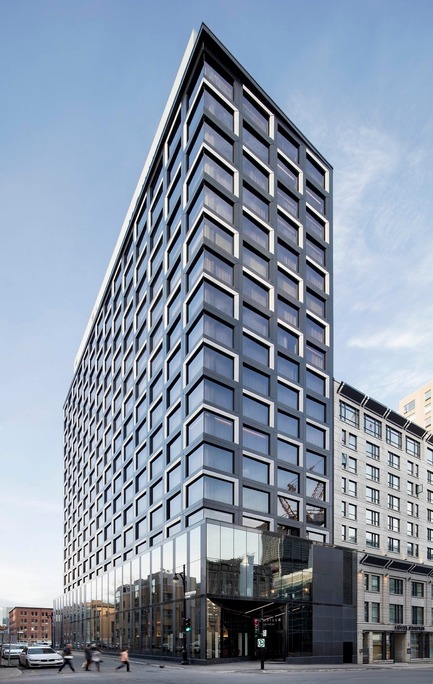 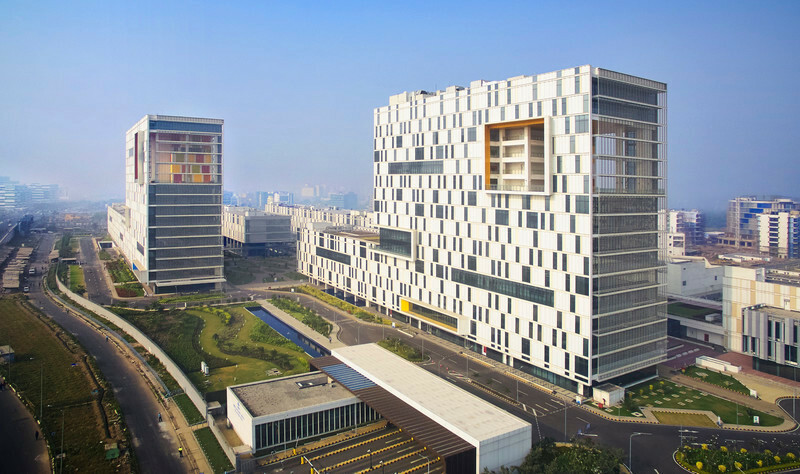 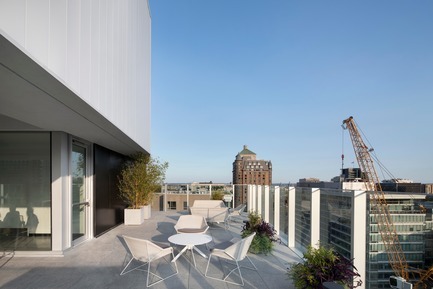 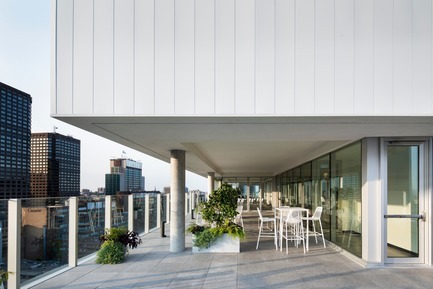 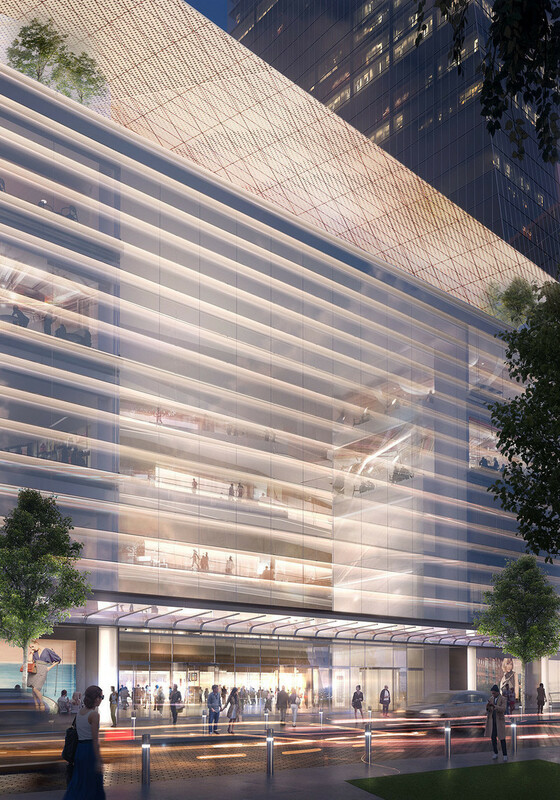 Over the past nine years, the studio has enjoyed a bold ascent and continues to complete even more ambitious, design-savvy projects on every scale, including commercial, residential, hospitality, interiors and master planning projects. 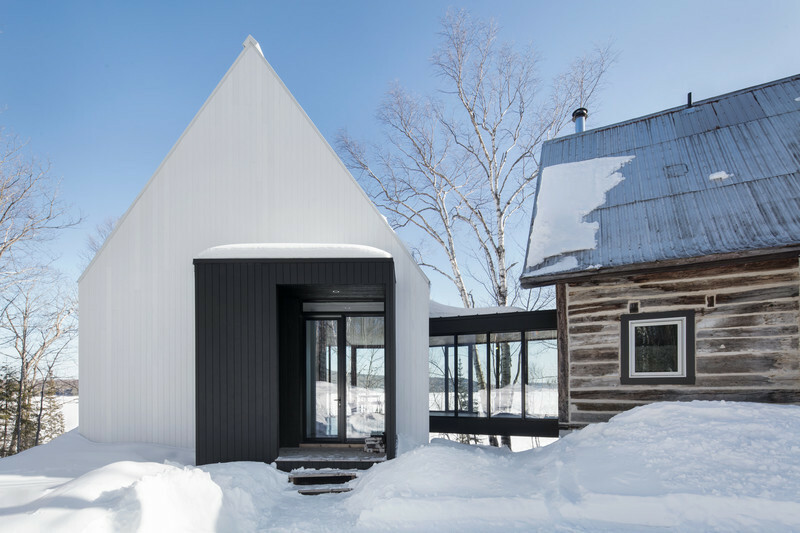 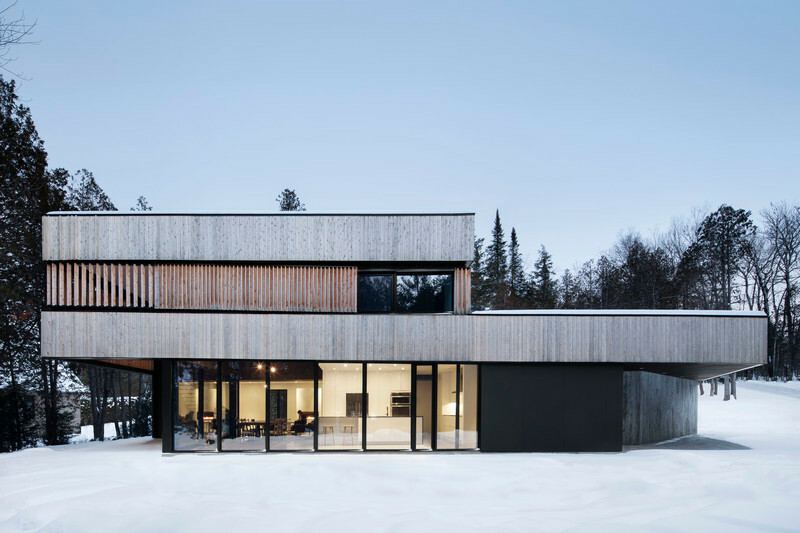 Under the direction of Maxime-Alexis Frappier, Joan Renaud and Etienne Laplante Courchesne, the studio’s work is timeless and highly tailored, with trim lines and intelligent planning. Clever touches add levity - such as anamorphic patterns or unusual juxtapositions of materials that instill a sense of spirit. 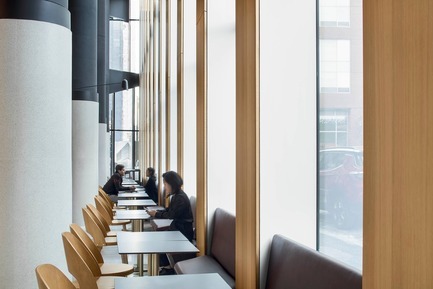 The quality of ACDF’s projects has been acknowledged through the recognition of 30 awards and accolades, including the 2010 Canadian Governor General’s Award. 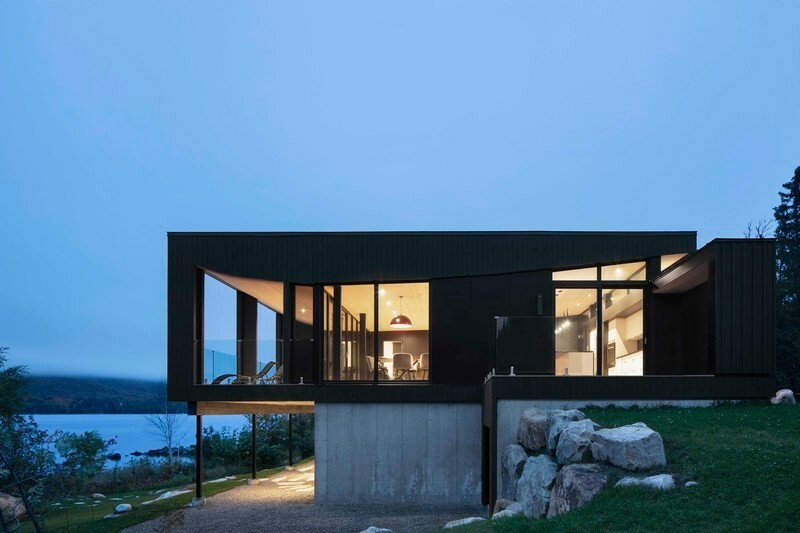 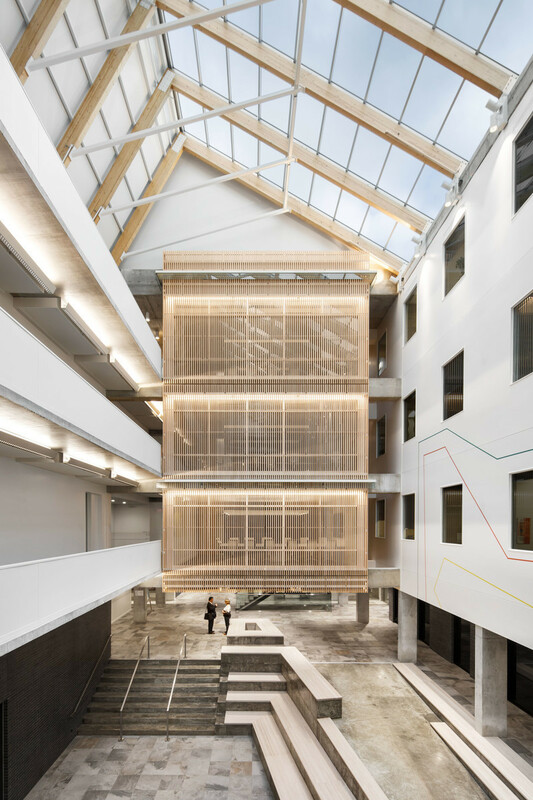 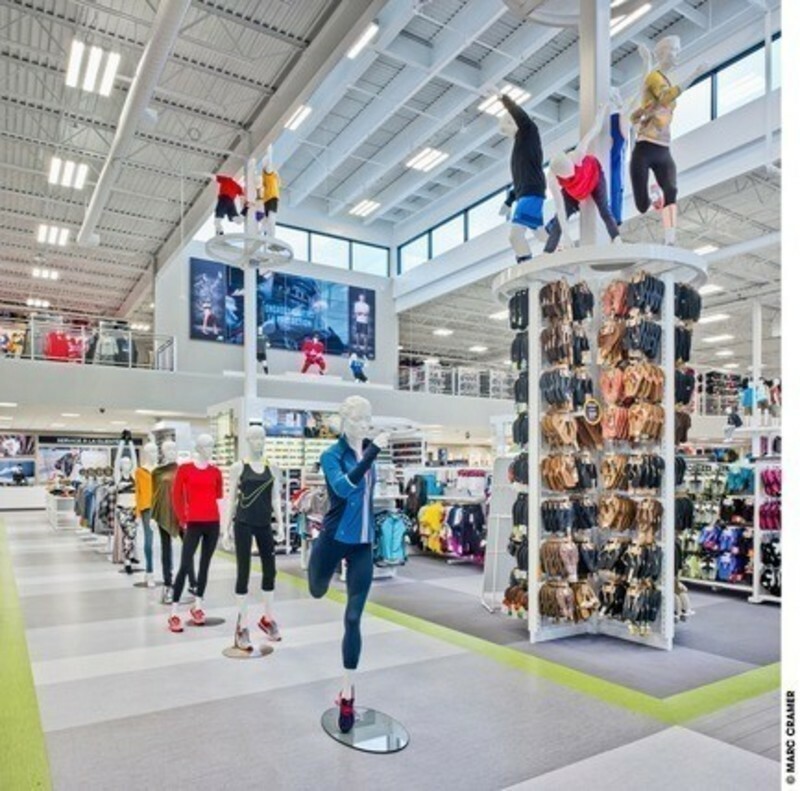 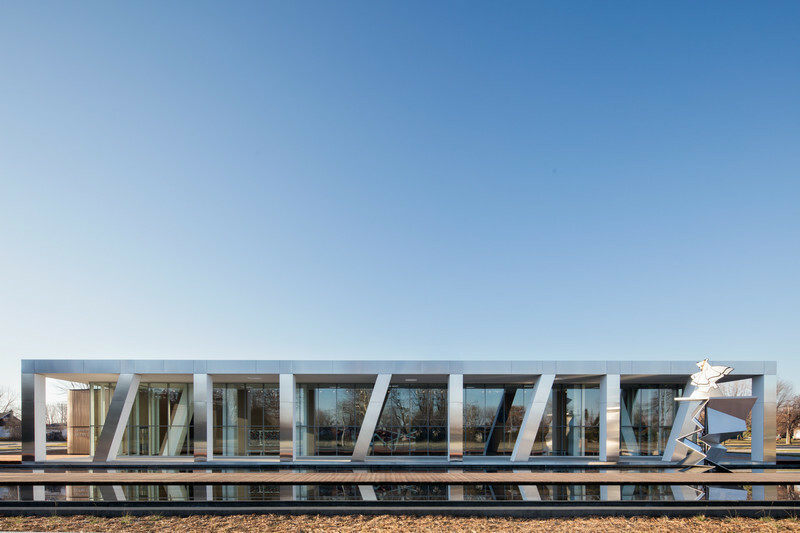 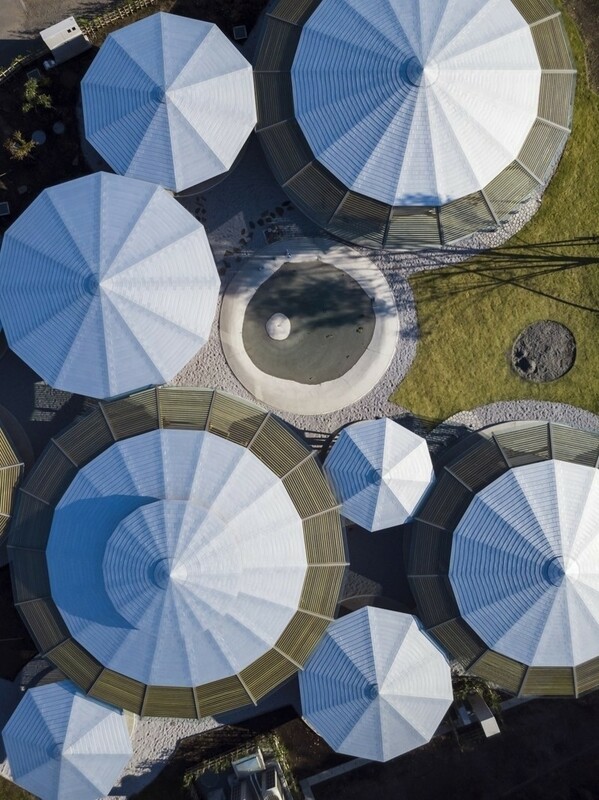 Most recently, the ACDF team was granted the prestigious title of Architect of the Year in Canada (40 years and under), awarded by the Royal Architectural Institute of Canada. 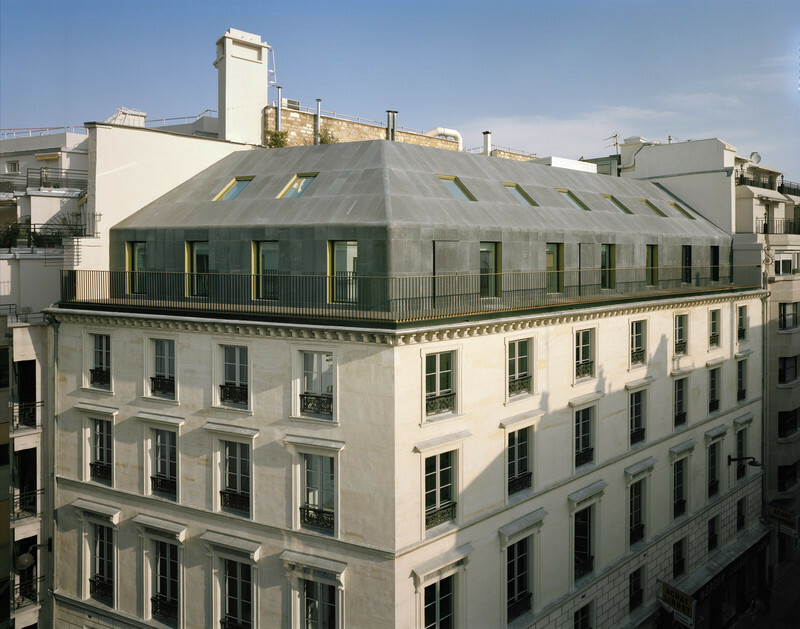 ACDF’s work has also been published worldwide. 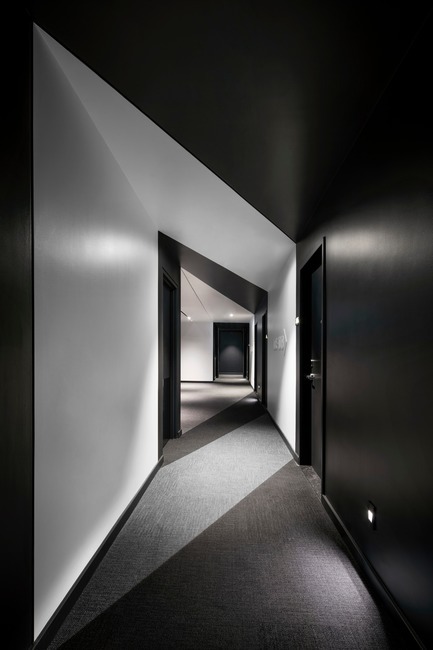 *Version française du communiqué disponible sur demande.